HKTag runs weekly ‘turn up and play’ tag sessions suitable for players of all abilities. 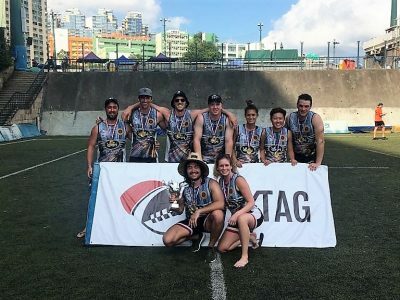 These Tag for All sessions take place every Sunday (excluding public holidays and match-day weekends) at one of three main locations across Hong Kong: Happy Valley, Aberdeen Sports Ground and King’s Park. Timing varies according to weather and pitch availability. Tag for All is an ideal entry point to joining Tag Rugby. The sport is great for fitness and caters for all ages, genders and abilities, with beginners getting the chance to familiarise themselves with the sport, rules and techniques. 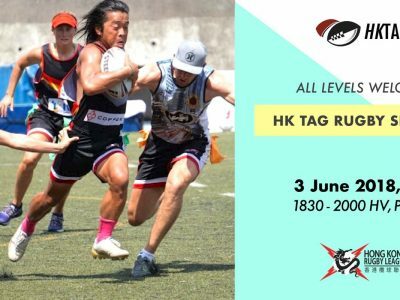 For experienced players, these sessions offer the opportunity to train, meet existing teams or form a new team ahead of the HKTag Super League at the end of the summer. All the information for upcoming Tag for All sessions is available on the HKTag Facebook and Instagram pages. Don’t use social media? The latest dates and times are published weekly on the HKTag MeetUp group.